Bewildered festival-goers at Glastonbury 2004 have had a helping hand finding their way "home" with a tent that lights up by text message. Over 100,000 music lovers have made the annual trek to the Vale of Avalon which means thousands of identical tents. Orange has designed a Text Me Home Tent with a receiver and antenna in it with a unique number to text. The limited edition tent is to show how mobile technology can make festival life a bit easier, says Orange. With a lightweight antenna and receiver box, as well as special luminous ribbing embedded on the tent's edge, the whole contraption is not overly cumbersome. The antenna simply slots into the dome of the tent, and a wire feeds through the fabric of the tent to the receiver box. When the receiver is sent a text message, it triggers the antenna to rise and light up as an orange beacon. The gadget could, in the future, be personalised further to display different coloured lights, or to play the mobile user's favourite ring tone. 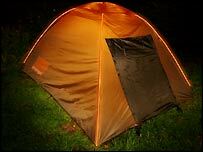 The idea grew from the solar-powered tents which Orange developed for last year's festival. This year's idea shows how gadgets and technologies, like mobiles, are becoming an increasingly essential, but simple, way of enhancing the festival-going experience. "It is just about making it easier so you can be freer to wonder, like the text towers we have here which have become a meeting point," an Orange spokesperson told BBC News Online. "Whoops - sorry wrong number"